Get moving with the Tiny Tot Driver! This brightly coloured role-play toy introduces animals, colours, numbers and places through fun phrases and realistic car sounds. 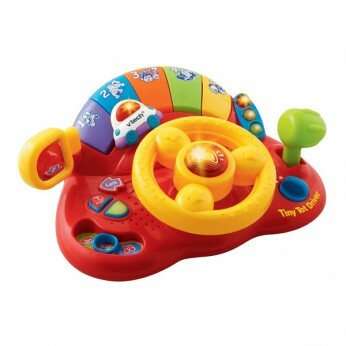 Baby can spin the steering wheel to move the mini car and drive to familiar destinations. Features include light-up horn button and wing mirror for self-discovery. Age: 12-36 months. Batteries included…. This toy costs approximately £16.99 (for the latest and best prices make sure you check our retailer list for the VTech Tiny Tot Driver above). In our review of VTech Tiny Tot Driver we classed it as being suitable for ages 1 to 3 years but recommend you check the manufacturer specific advice before purchasing.